On November 15th, a number of MCH patients were greeted with a surprise visit from members of their favourite football team. Accompanied by their mascot Touché, Montreal Alouettes players Danny Desrivaux, Matthieu Proulx and Scott Flory took an afternoon off from preparations for the Eastern Conference final, and spent their afternoon reading and visiting with some enthusiastic fans. The Montreal Alouettes kicked off their province-wide Touch the Hearts Tour at the MCH, the first of five presented by TELUS. The players brought smiles to many children's faces as they spoke, played games and took photos all through the event. After more than a few autographs were signed, the children were invited to participate in a special story-telling activity with the players. "It really puts things in perspective to see people who are fighting real fights. We might put a smile on their face, but it is just as special for us to be here," said free safety Proulx. The visit could not be possible without the help of TELUS who donated $22,000 to The Montreal Children's Hospital Foundation. The donation will go towards purchasing new medical equipment for the hospital as well as further research to help save lives of Montreal's sick children. "At TELUS, we enjoy giving where we live," said Vice-President of Marketing and Communications Patrick Corneau. 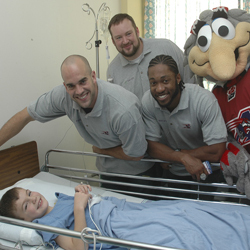 We believe that the tour with the Alouettes offers some moments of joy for sick children. To see their favourite athletes come visit them can really help get them through tough times."